Reading Time: ~ 4 min. Following last week’s profile of yet another InstallCore Potentially Unwanted Application (PUA) campaign, we detected another rogue ad campaign this week. This time enticing E.U based users into downloading and installing a fake “Free Codec Pack”, with the users sacrificing their privacy in the process due to the additional toolbars that will be installed on their PCs. Based on our observations, the campaign operators use a variety of paid ads on top of the search results on some of the most popular search engines, and naturally, take advantage of market/segment targeting, only displaying them to selected audiences. Detection rate for the Potentially Unwanted Application (PUA) InstallCore – CodecPack.exe – MD5: 2f959f5783e36e30a89f8f3ec666f16d – detected by 7 out of 45 antivirus scanners as Win32/InstallCore.BN.Gen; Adware.InstallCore.114; Artemis!2F959F5783E3; TROJ_GEN.F47V0522. The sample is digitally signed by ‘ClickRunSoftware’. We’ll continue monitoring these ongoing privacy-invading campaigns serving Potentially Unwanted Applications (PUAs). 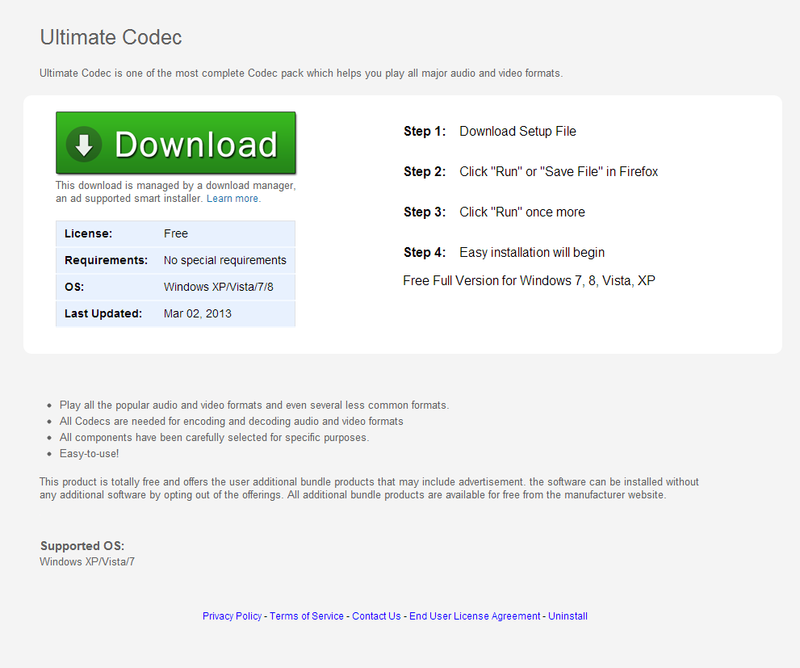 Meanwhile, users are advised to avoid installing the rogue “Ultimate Codec” application.